"God, this must have been a difficult year for you." It is hard to believe that it has been a year. One year of learning how to be a single parent to his daughter Olive. One year of quitting his job and writing a memoir. One year since he last saw his wife and his world changed forever. Even after a year to cope, Jonathan Flanagan still has more questions than answers. His wife Billie Flanagan went missing after embarking on a solo hike through the Desolation Wilderness. She vanished, never to be seen or heard from again. Now Jonathan is left to pick up the pieces. "How many times can he write and rewrite the story of his life with Billie before he'll know what was really true?" With no body and only minimal clues to definitively prove what happened to his wife, Jonathan is left in an emotional and financial limbo. Someone covertly recorded his eulogy at Billie's memorial service. His speech was uploaded to the Internet and quickly went viral. Jonathan was able to spin this moment of fame into a book deal that allowed him to quit his demanding job and spend more time with his daughter. As the money from his publishing deal dwindles away, Jonathan begins to question how well he knew his wife. How can he write a book about their life together if the life he knew was a lie? "All memoirs are lies, even those that tell the truth." Olive is facing a crisis of her own. Her close relationship with her mom was cut short by Billie's disappearance, and Jonathan's best efforts to fill that void are not working. A year later, Olive finds it hard to continue going to school and fit in with her friends. As she is walking to class, the world around her disappears and is replaced with the image of her mother, alive and well, beckoning her to look closer and trust in herself. At first, Olive attributes this vision to being a side effect of the anniversary of her mother missing. But Billie continues to visit Olive in these strange visions, and Olive gets the idea that Billie is trying to tell her something. For whatever reason, Billie wants Olive to look for her. Could her mom still be alive? "You believe what you think you believe, until suddenly, you realize that you don't anymore." Watch Me Disappear is a brilliant novel of family and suspense. Author Janelle Brown has written a poignant character study veiled by an engrossing mystery. At its heart, the novel is about a father and daughter dealing with the repercussions of losing a piece of their family. I was reminded of Maria Semple's Where'd You Go, Bernadette, in that the book focuses on a father and daughter searching for the truth behind a mother's disappearance. That being said, Brown's novel goes much deeper in creating a mature and nuanced depiction of the delicate intricacies of the character's relationship. While the mystery of Billie's vanishing is the impetus for the character development, it is the way Johnathan and Olive evolve throughout the story that drives the narrative. Watch Me Disappear is a thoughtful and emotionally moving novel that works as a solid mystery and even better family drama. 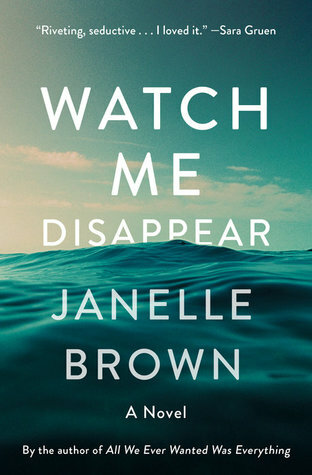 This entry was posted on Tuesday, July 11, 2017 and is filed under Book Review,Character Study,Family Drama,Janelle Brown,Maria Semple,Mystery,Watch Me Disappear,Where'd You Go Bernadette. You can follow any responses to this entry through the RSS 2.0. You can leave a response. I think I would enjoy this. Thanks for putting it on my radar Ethan! Wow this one sounds really good. Definitely going to see if my library has a copy. I really enjoyed it. Thanks!